I have had enough of vampire movies. This movie trope has run its course and should die with the zombie movies that are also a dime a dozen. What do I propose to take its place in modern horror and paranoia thrillers or even romantic dramas? Cannibals. 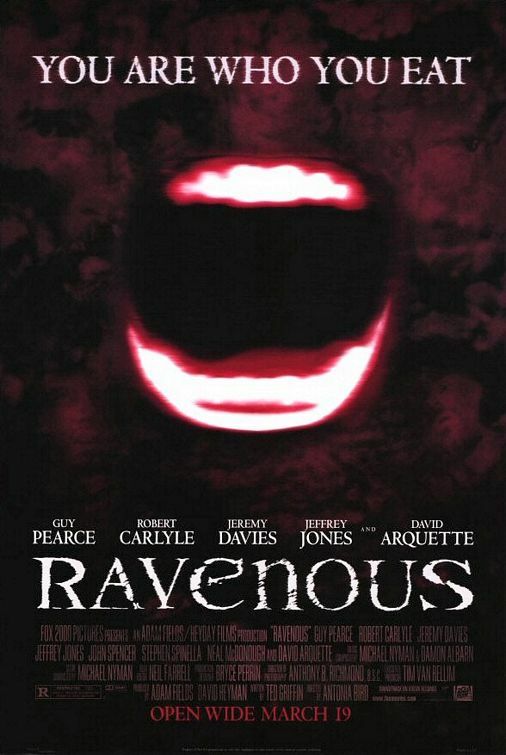 Ravenous is a quirky movie that was released in 1999 to little fanfare. It stars Guy Pierce as a coward solider during the Mexican American War. He is transferred to a small outpost in the California forests as a punishment for his cowardice. This outpost is nearly deserted for the winter and they work with a skeleton crew that all have their unique character traits. Within a couple of days of this solider being at this fort, a dazed man enters the encampment. He reveals that he has been traveling with a group of people who had to turn to becoming cannibals in order to survive this harsh winter. He reveals that there is a sadistic man still alone with one of the group of travelers. The soldiers deploy to search for this couple but weird things start to happen. This man doesn’t seem to be in his right mind at all. Eating human flesh has turned him into something that isn’t altogether human. A menace is unleashed on this small encampment and it will take all of the solider’s courage to overcome it and stop it. This movie is hard to pin down. At times it is a comedy chase film, at other times it is a grotesque horror film and still at other times it is an Indian mysticism film. Guy Pierce’s character is our grounding force that is able to be our audience surrogate. He is thrown in a unfamilar terrain and then has to discover how to overcome this superhuman menace cannibal creature (who is played wonderfully by Robert Carlyle). Although unintentionally funny things happen in the movie, we are still able to see the gravity of the situation because we see the action through this outsider’s perspective. What makes this movie more than just a silly action horror comedy are the theme present in both the cinematography and the script. Both the star, Guy Pierce, and the director were vegetarians at the time of making this movie and it is painfully obvious that this proclivity informs the film. You could probably even make a case for this being anti-meat propaganda. Meat is made to look disgusting and akin to killing a real human being. This theme is made apparent by the first scene where Guy Pierce’s character is attending a banquet thrown in his honor. He is surrounded by his fellow officers and huge slabs of steak. As his compatriots dig into their steaks with savage gusto, the solider becomes repulsed and finally has to leave the room in order to barf. Not only does this opening scene establish the character’s inherent squeamishness, it also gives an aversion to the copious amounts of meat present in the rest of the film. This movie is essentially about treating other humans as nourishment in order to stay healthy and vibrant. So the theme is called for, it is just a little overt.